Vaseline is one product that can be used for a lot of things. 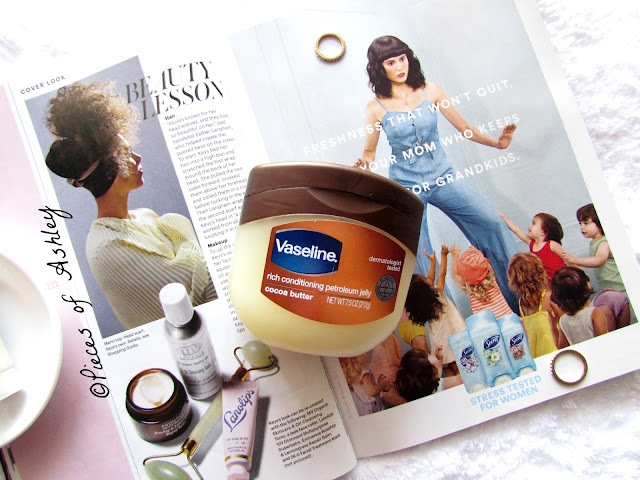 I am sure the possibilities for Vaseline are endless, but here are my 5 ways to use this! It is said that Vaseline is not even a moisturizer, but I think otherwise and I am sure of you do as well. I mean why else would we use it? Why was it even created? I use Vaseline all year long. But for the colder months a head Vaseline is your best friend. Having chapped lips during the cold seasons are not the best. Sometimes having chapped lips can even be painful, but don't worry because Vaseline helps with this problem. This keeps your lips moist. Although it's said that Vaseline is good for keeping your hair moisturized, I have not tried this method before. But what I use this for is to tame the baby hairs. This works great! You can use a brush, to brush down the hairs. You can even use a toothbrush that was not being used, it may sound weird but apparently it works for people. Most of the time I use my fingers. Vaseline is great to use for the bottoms of your feet. After you take a shower or bath, just rub the heels of your feet with Vaseline. You can lock in moisture by putting socks on. This will leave your feet feeling moist and hydrated, instead of dry and flaky! If you run out of makeup remover, have no fear Vaseline is here. This is a great substitution for the normal makeup remover. You can put the Vaseline on your fingers/ hands, q-tips, or tissues and then you rub where ever the place your makeup is on. Then after that you can continue your normal nighttime skincare routine. I have never used eyebrow gel. To be honest I didn't know that it even existed. But for those of you who use eyebrow gel, can use Vaseline as a substitute to keep those bad boys in place. I think it works great and your brows stay in place! You can either use a eyebrow spooley or your fingers. I hope you enjoyed reading! What do you use Vaseline for? I never tried it as eyebrow gel. I will have to try that.